Vegan cooking can be very easy too! 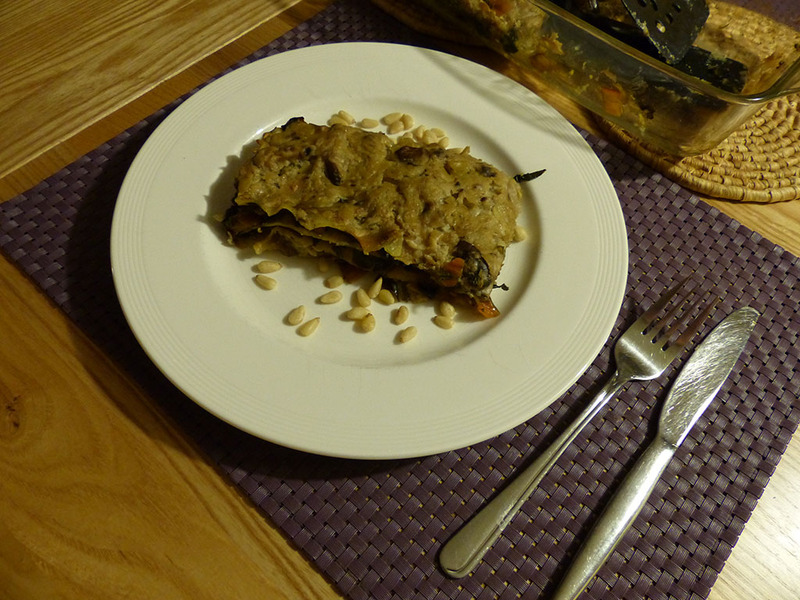 This vegan lasagne uses vegan ingredients and gluten free lasagne sheets. And to make it even greener, it's made with seasonal ingredients. Heat 2tbsp of the oil. Add 2/3 of the chopped onions and fry for around 3 minutes, add the mushrooms and fry until the mushrooms have softened. Add the rice flour and stir for 1 minute. Slowly add the oatly to the mushroom mixture, adding a little bit at a time and stirring all the time as well, so you get a nice smooth sauce. Heat the last 1tbsp of the oil and add the rest of the onions, fry for 2 minutes before adding the spinach or chard. Heat until the spinach/chard has shrunk. Make the lasagne starting with a layer of mushroom sauce, then lasagne sheets, then spinach and so on until you finish with a layer of the mushroom sauce. Serve with Engevita to taste.